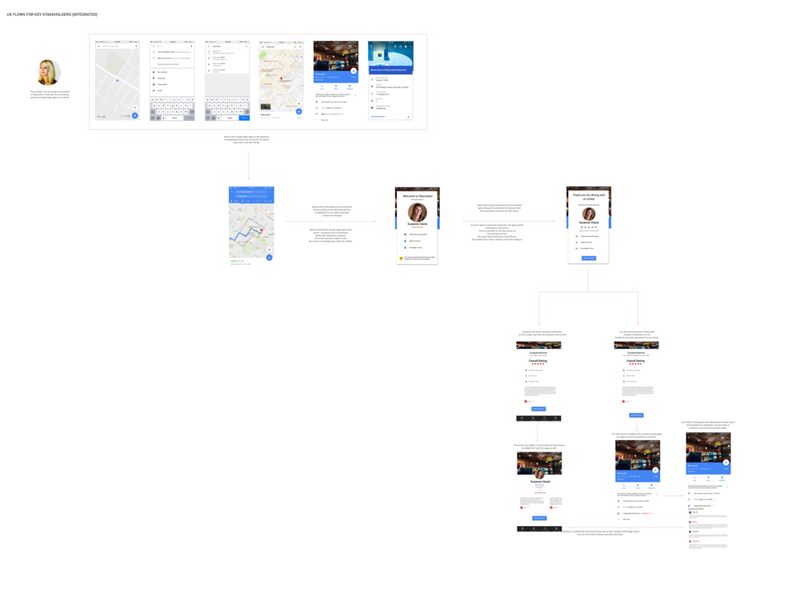 The scope of this design exercise is User Research + UX and Interaction Design. I have used readily available UI elements for the final mockups to bring some life to the design. The scope does not include visual design. I spent sometime reading up reviews, blogs and articles to gain some context around the problem statement. 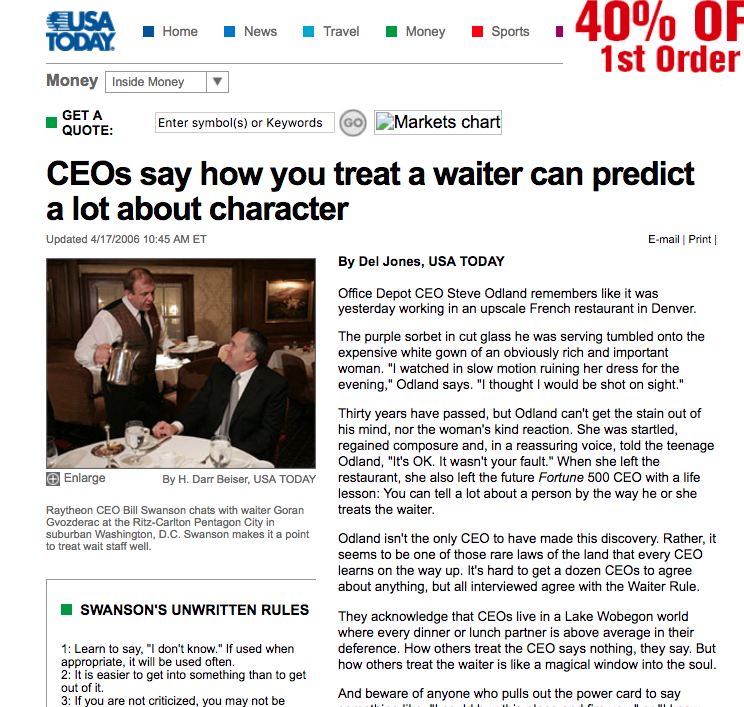 I also researched products/apps that may offer the capability to rate wait staff in restaurants. 1. This is a two-way ecosystem: As much as customers desire great service from their waiters/waitresses, the wait staff also expects a certain code of conduct from restaurant customers. Being able to communicate these expectations across both stakeholders will enable better experiences. 2. Waiters are driven by the potential of improving their earnings (overall bill and tips). This motivation can be tapped into to drive better behavior change and improved service. 3. Restaurants do have a stake in this equation. Poor service and attitude from wait staff could impact business and overall brand. Restaurants could play the primary sponsor role in this solution. 4. When waiters and customers build a good relationship - magic happens. Its a win-win for all stakeholders. How might we make this magic replicable? I created a constraint for myself during this design exercise in that I will not design a new app. How might we offer a new experience, service and capability through an existing app that is widely used? When I think of going to a restaurant I just open Google maps and look for it. I am seeking basic information such as what are the hours of this place, how long will it take us to get their, what is the general rating and price point? I can book a table from my maps app or even call them to do so. Its my goto app for restaurants. Why not create a micro-service within the maps app to enable customers like me that additional insight about waiters in that restaurant? While there are merits to this approach, the key challenge will be to distinguish the purpose and functional association of social products such as Google + against professional objectives. Given the time available for this exercise I was unable to test whether this experience can truly sustain as a micro-service embedded within an integrated suite of apps or needs its own independent existence as a separate app. I would have liked to conduct research at a much larger scale to gather enough data to validate my hypothesis early in the design cycle. 1. Multi-stakeholder - how does everyone get access to it if its integrated into an existing app? 2. Anonymity and Privacy of users. 3. Trust - not being able to delete negative reviews. e.g, Glassdoor and Yelp. Many users were not convinced that they cared about rating servers. Most users loved the "tips" feature and someone suggested it be called "Conversation Starters" not "Tips"
On the feedback feature page the feedback was to add context about the restaurant - too much emphasis on the server. Privacy seemed to be a big issue. "I don't want to be connected with my waiter. I am happy to just rate them discreetly."